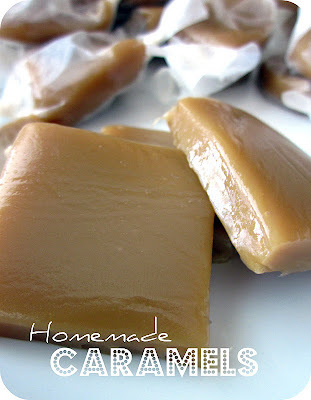 I love homemade caramels, but have always been so intimidated by them. I then got up the courage to make these, and they were out of this world. They were so easy to make and tasted absolutely amazing. You will love these. Every Christmas season, our neighbors would bring over a plate of goodies. You always wanted to be home when that plate arrived, or you would be left with crumbs of delicious chocolates and treats. I would fight for those lovely, little caramels. I finally decided to take matters into my own hands. I made caramels. I thought it was going to be so hard, but they were are a breeze. Now I don’t have to fight my sisters off for one piece of caramel. I finally went out and bought a candy thermometer. It was a lifesaver. They are only $2.97 at WalMart right now. They have always intimidated me in the past, but after making these caramels, I realized how helpful they are. I am excited to use my candy thermometer more often. I threw some in a bag and had an easy gift for neighbors. You can print off the tag for free HERE. I love the combination of sweet and savory. I have always been a fan of salted caramels, but I made my own, and became their number one fan. These were so delicious and so easy to make. I just added a little bit of sea salt, to the caramel. Once it is in the pan, I would sprinkle it over. If you wait to long, you may be to press it in with your hands a little. We recommend just sprinkling it on top, not mixing it in, to the caramel. Cleaning up, after making homemade caramels, can be a big pain. However, there is a simple solution to cleaning up a sticky, caramel covered pan. We recommend filling up the pan or pot with water, and letting it boil. The caramel will melt and dissolve off the sides. you can even put in the tip of your candy thermometer towards the end, and let that caramel, melt off as well. Melt butter over stove top. Add brown sugar and salt, mixing well. Cook and stir over medium heat until candy reaches firm ball stage (245 degrees). This will take 12-15 minutes approx. Pour into greased 9x13 pan. Let cool. Cut into 48 pieces with a sharp knife. Optional: Wrap each piece in wax paper. I want to make that today! Thanks for the recipe, looks amazing! Receipe looks easy. I am going to try these next Christmas. Have you added the "Pin It" button to your bookmarks bar? I hope they turned out okay! 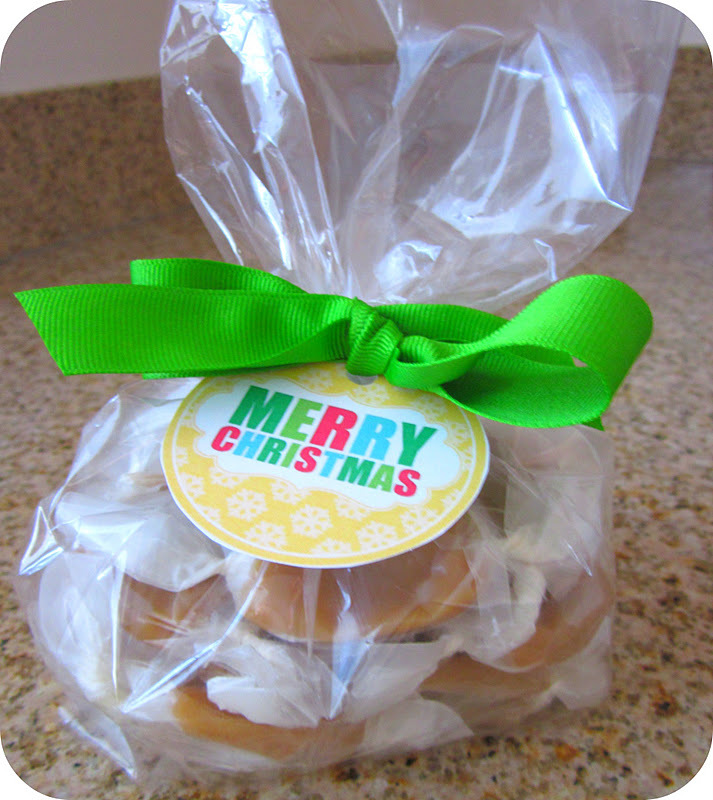 I am excited to try your caramel candy's!!!! I love carmels I will definatly try this thanks for sharing!! Will this work to cover apples?? Have you tried that?? I haven't tried that, but I'm sure it would be delicious! You just wouldnt cook it to firm ball stage, soft ball temp would work best. Dont remeber off top of my head but most candy thermometers have it labeled right on them. Do the wrapped carmels freeze well? If so any suggestions? I have never had enough left over to freeze them. I am not sure how it would work! I am so sorry I am not more help. Let us know if you try it! OOOOOOO - I Love Love Love caramels..yours look divine. MMM! I think I will make these and dip them in chocolate. What is better than caramels and chocolate together????? Thanks so much girls! I made these last night for my family and we really like them. Now I have to find someone to share them with. Thanks for sharing great content. I am wondering if this recipe is good for making caramel apples and caramel popcorn? This is really similar to our caramel popcorn recipe on our blog. im gonna make these right now! These were super yummy! Thank you soooooo much! How long does it take to turn solid? Mines seems to be taking forever. Also can I make them solid by putting them in the oven or fridge? Why are you called the six sisters? How long do these take to cool? Also, can they be cooled in the fridge or will this make them too difficult to cut? Thanks! Let them cool for about an hour or so. I just found this recipe on Pinterest. It is very similar to my mom's classic recipe. Do your caramels harden when they cool or do they stay soft, or somewhat soft? I followed the recipe exactly. The color and flavor is great but mine are really hard, instead of soft and chewy. Any thoughts? I took it off of the heat as soon as it hit firm ball. My son added some sea salt to the top of part of the pan so he could have sea salt caramel. Just wanted them to be soft. I'm stumped. Help please! She doesn't say whether or not she used a candy thermometer. It may have cooked too long. These should be fine for a week in an airtight container. We wrap each piece in waxed paper. Hello! I have a quick question. Did you make high altitude adjustments to this recipe? No need to butter pans if you use silicone - works great! Just flip out onto a plastic cutting board before cutting. And I keep wrapped caramels in the fridge for a month or more this time of year and they keep perfectly fresh. I have made these twice. The flavor is outstanding but, both times I got an area on top where the caramel crystallized and was very gritty. I followed the directions exactly (stopped stirring when it started to boil, used a buttered dish and used a candy thermometer (I even cooked the second batch a little less in case my thermometer was off my caramels were not as firm but still gritty on top) What in the world am I doing wrong? I want to use these as gifts but so far only about 1/2 of the batch is salvageable. Help! Hi Kerry! I am so sorry! I can't figure out what the problem could be. I know humidity, elevation and so many things can change the outcome of recipes. I am so sorry about that! I have made turtles for Christmas and need to know how to store them. I have read that you put them in an air tight container for a week. Well it's two weeks until Christmas and have no other time to make these. Are they going to be okay if left in the refrigerator until needed? I hate to have wasted all these ingredients and money involved. Thanks for any suggestions you can give me. Merry Christmas to you all and Happy New year. Hope to hear real soon from you. Also can they be put in layers in the container seperated with parchment paper without them sticking? They should be fine in the fridge in an airtight container. Parchment paper between them so they don't stick is perfect! Can cream be substituted for the sweetened condensed milk? With this recipe you need to use sweetened condensed milk.